The General Data Protection Regulations (GDPR) specifies that you must show your customers what information you hold about them. These are called data access requests and can be submitted at any time to your company from customers, also known as data subjects for the purposes of GDPR. 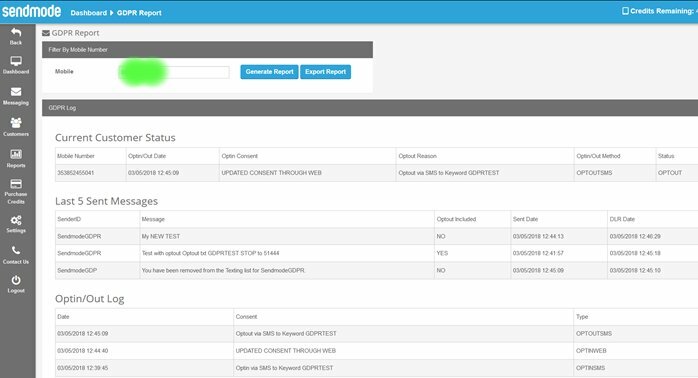 Sendmode has two new reports for Data Access Requests. This report is specifically designed for data access requests and allows you to search for a mobile number in your customer list will bring up their current status (opt-in or opted out), the last five messages send to that number and a log of when they opted in or out. The report can be exported and emailed directly to the customer. The screenshot below shows a GDPR report for a sample number. If you would like a bird’s eye view of your current opted-in customer list you can do so in the Marketing Consent Report. The report can be filtered by Opt-In Type, There are 3 OptIn Types example, Opt-in Via Web, Opt-in via SMS or for API users, Opt-in via API. Opt in Via Web. When you add new customers using the import function or by simply adding customers individually, they will be marked as Opt-In via Web. For Developers only Opt-in via API. We have extended our API to include opt-ins and opt-outs and this is the subject of a separate blog available. It can also be filtered by Consent given, for example, if you imported a batch of new mobiles with the tag ‘Xmas Draw 2018’, you can retrieve all these numbers using this report. You can also see which Consent method generated the highest number of opt-ins for your business. Tip: An example of a GDPR compliant consent form for future in-store competitions can be downloaded here. The screenshot below illustrates the report and filtering on Opt-In Type and Consent. Thank you for your time, we hope you found this blog useful. This article was posted in Blog - All Entries, GDPR and tagged GDPR, GDPR Compliant Marketing.